On this rare day in July with lots of hikers, the Charlottesville Chapter was able to offer options of an easy hike or an easy trail maintenance trip on a hot day. Andy Willgruber’s group headed to Little Calf Mountain, while Karen Siegrist, Marty Snell, Claire Cline, John Sinclair, Norman Beil and Iva Gillet traveled south to Nelson County and a rail trail. Predicted for temps in the 90’s, a flat hike on the banks of the Piney and Tye River seemed an excellent choice. Departing from the trailhead on Rt 151, we hiked more quickly than in the mountains, but stopped to read the signs which tracked the history of the area from hurricane Camille to the rise and fall of American Cyanamid in the production of titanium dioxide and its pollution of local rivers. This 7 mile one way trail is a lovely and mostly shaded, crossing the Piney and Tye rivers several times. It is open to hikers, cyclists, and horseback riders. After our two mile port-a-potty break, who should appear on the trail- John Brandt- who else?! We hiked the trail for 4 ½ miles and then turned around to make a 9 mile round trip. There is a lovely covered bridge on the trail and we picnicked on the bank of the river beside it. Several of us enjoyed a swim in a deep pool. That made our walk back all the more pleasant. The shade was lovely, and we enjoyed good conversation while avoiding kids on bikes on the return trip. Several of us then headed to Wild Wolf for refreshments before returning to Charlottesville. A non-traditional hike for us, but fun and exercise all the same. This hike went head-head with another chapter hike in the AHS parking lot this morning and held it's own! Four dedicated volunteers signed up to help A.T. trail maintainer Andy Willgruber including two newcomers. Olivia Stoken plans to thru-hike the entire A.T. after completing her degree at UVA; she was actually disappointed that we weren't painting white blazes today! Ami Riscassi has previously been involved with PATC cabins;she loves to see the difference that painting makes! The always sunny Sunny Choi came out to try her hand at trailwork; she already knew she had painting skills. She found out today how good she was with the loppers! Chapter President Emeritus Lindsay Brown lent his wisdom and superb trail standards to our operation. The crew jumped into Andy's car and we headed to Beagle Gap. On arrival, we divvied up painting and sanding equipment; everyone also grabbed a trail maintenance tool of their choice. We headed north on the A.T. while doing light clipping along the way. On arrival onto the Little Calf Mt. bald, we took a few minutes to admire the panoramic view. Now, it was time to break out the paint. Our main task for the day was to complete the job started on March 28 by the Virginia Environmental Law Forum (UVA Law School). 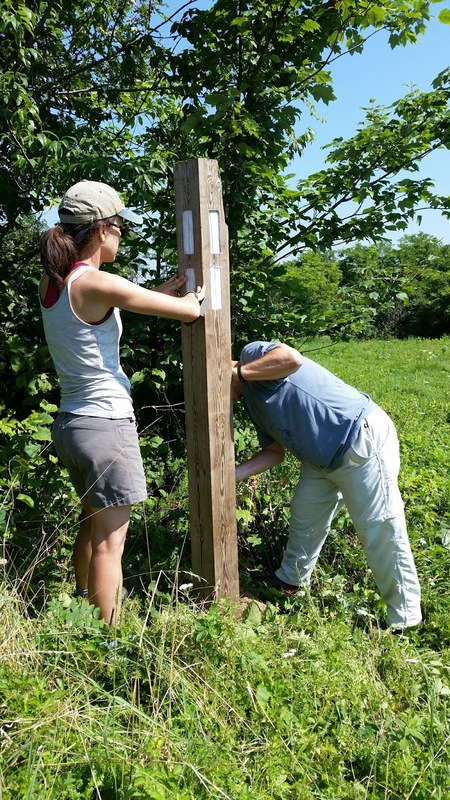 They had installed four 6x6 blaze marker posts under very challenging conditions (story on our "news" link posted in April, 2015). The 30 degree temperatures on that day prevented painting; we had perfect painting conditions today. We divided into two two-person sanding/cleaning and painting teams. The work proceeded quickly and pleasantly on the four posts spaced over the next 1/3 of a mile. We laid down the painting tools at the last post. This post marked the junction where the relocated A.T. rejoins the old and so finally completes the Calf Mt. Relocation project started a number of years ago! We continued north to the summit of Calf Mt continuing with our light, occasional clipping. The elevation, shade and low humidity made for very pleasant hiking conditions, especially on the summit and north of Calf Mt. Sunny was moved to say she felt "transported to another place"! We admired the two ancient white oaks located just before the side trail to the Calf Mt. shelter, then proceeded to the shelter's picnic table for lunch. The lunchtime treats included a variety of chocolate candies from Andy including some from Germany that seemed to be a hit. Ami also shared some delicious homemade zucchini bread--it's been a good garden year! It wasn't easy to leave this very pleasant shelter, but we decided to resume our hike and give up the picnic table to a couple of weekend backpackers. We returned the way we came and hiked back south 2-1/2 miles and hopefully burned off some of those extra lunch calories! We arrived back at Beagle Gap and toasted the day's success with some cold Bold Rock Ciders! The consensus for a post-hike stop was the Greenwood Gourmet Grocery where various necessities were purchased. We arrived back at AHS a few minutes before 3:00.
the day. Total distance 6 miles with about 1500 of elevation gain. We had 11 people starting from the Jones Run parking area to hike down the Jones Run Trail passing some of the most beautiful waterfalls in the southern section of the Shenandoah National Park. Thanks to the recent rains the water was flowing full force and although it was pushing 100 degrees in Charlottesville the mountain elevation and tree shade made for a very pleasant hike. Joining me (hike leader Dan Ralston) on the hike were Jeanne Densmore, Kelly O’Rourke, John Brandt, Claire Cline, Pete & Bev Fink, Jodi Frederickson, Dave Abdullah, Grace Niu and her friend Kay Lee. We returned, starting on the Browns Gap fire road until it intersected with the AT. At this point seven of the folks decided that 7 miles just wasn’t enough for such a wonderful day in the mountains. So as Dan led Grace, Kay and Jeanne back south on the AT to the parking area, Kelly led the rest of the folks a couple more miles before returning on the south bound AT. 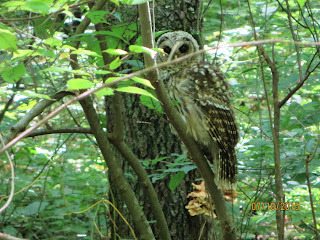 It was a beautiful day for a wonderful hike, but to add even more excitement we saw a huge magnificent Barr owl (thank you Claire for the ID) near the waterfalls and most of us spotted bears with cubs on the drive out. 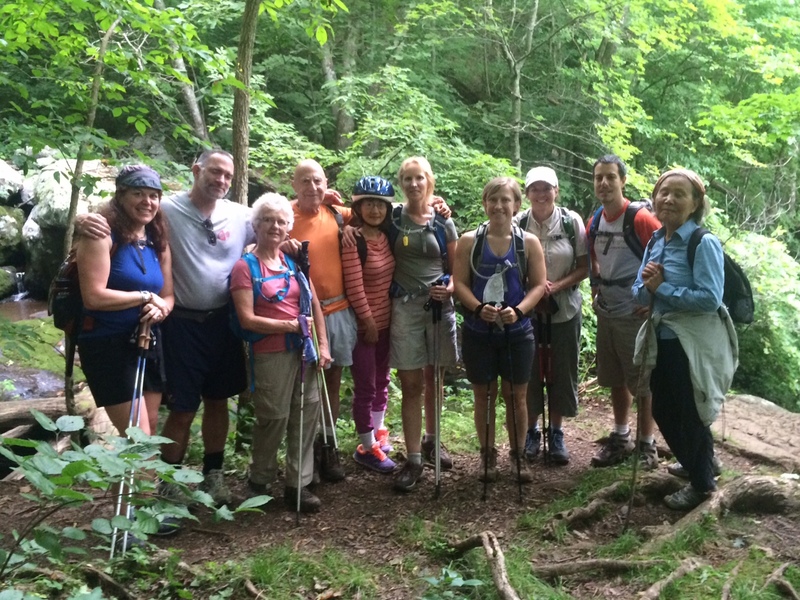 What a fantastic group of hikers and simply an amazing day in the outdoors. Every day should be as good. After a week and a half of rain, there was a bevy of activity on the Vining Tract as trail and cabin overseers took full advantage of the beautiful weekend to tame the overgrowth on the trails, and touch up paint on cabins. Bill Holman dispersed three different trail crews to help with removal of fallen trees, trail inspection and trimming, and trail introduction for two new trail overseers. Jodi Fredrickson and Dave Abdullah met their new trail, Matties's Run Loop, and now know the challenges that lie ahead to rehabilitate this new group of trails. Lisa Lampe, and her sweet dog Max, joined John Sinclair as they checked out the western trail sections near Mattie's Run. Iva led newcomer Chris Dellett and Brian Muszynski to check out many of the trails around Wineberry, Conley, Butternut, Morris, and Mutton Top cabins, most which were in excellent shape. The Orion Trail, another new trail to the track was very overgrown, so we concentrated most of our efforts here hacking back tall weeds and removing downed limbs. Chris and Brian worked hard to clear the trail ahead of Iva, making sure there were no snakes as she followed. Upon completing a loop we passed by Morris Cabin where the overseer Jack Ryan and a friend were performing spring cleaning- painting window sills, cutting knee high grass, sweeping the floors, and removing extra supplies left behind. Bill and Mark Walkup, a dedicated overseer of several Vining Trails, proceeded to the Cliff Trail and followed an abandoned trail to an old homesite. In March, UVa students had worked to clear this trail so that logs could be removed later by this Chain Saw Crew. Geoff Manning-Smith meanwhile was working hard on northern trails, weedeating the orchard and then pitching a tent to spent the weekend. Marit Gay who was unable to attend for our group trip, had already come ahead to clear Mutton Top trail she oversees. Mid-afternoon we retreated to Butternut Hut for refreshment. Lisa, Jim, and Chris headed back to Charlottesville and the rest of us settled in for a wonderful potluck picnic and refreshments. CJ Woodburn joined us for the evening too. Jodi and Dave stayed in a tent, while the rest of us enjoyed the confines of Butternut. It was a productive and fun weekend for camping, trail work, and comradery. Weeds were hacked back, logs removed, trails redefined. Great times on the trail!